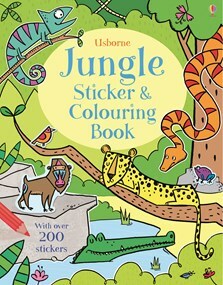 There are monkeys, tigers, elephants, snakes and lots of other jungle animals to meet in this colourful sticker and colouring book. With over 170 animal stickers to add to scenes such as the jungle at night, a murkey swamp and the Amazon river. Children can colour a baby tapir visiting the swamp, snakes, frogs and chameleons on the jungle floor, a crocodile dozing on the banks of a river and lots more. Perfect for long journeys and quiet times, plus a fun way for children to learn new animal names and build their vocabulary.